In the cozy living room is a large corner couch with coffee table, TV with radio and DVD. A Swedish stove provides a nice warmth on cold days. There is also a dining table with 2 chairs in the living room. The large window front provides for a bright room with panoramic views and access to the balcony. The bedroom has a double bed with bedside table, wardrobe and chest of drawers. Bed linen is of course available. The apartment has a fully equipped fitted kitchen with hob, fridge (incl. Freezer), coffee maker, kettle, toaster and dishes, tea towels and a small dining area. In the bathroom you will find a bathtub with shower cubicle, WC, hair dryer, washing machine and towels. Welcome to the apartment Himmelblau! Are you planning a vacation or are you traveling professionally in the Bamberg area? Then you are exactly right with us! Our apartment is 50 square meters and is located in the attic. It has 2 rooms, a new kitchen and a bright bathroom. Our house is in a quiet location and from the large balcony you have a wonderful view of the Friesener Warte, our local mountain. The apartment is a smoke-free area, but you are welcome to enjoy your cigarette on the balcony. 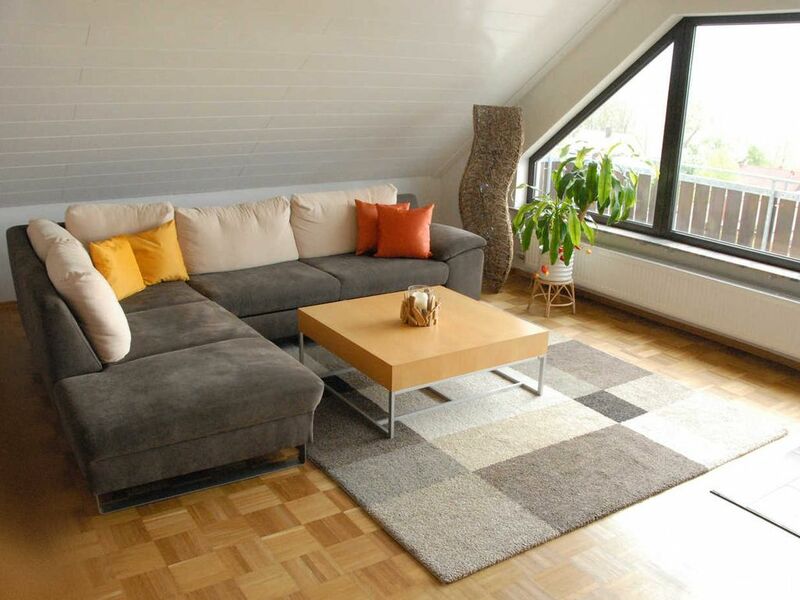 Our house with apartments is idyllically located between Bamberg and the Franconian Switzerland. In our garden you can play table tennis. It is also possible to rent a professional fishing tackle. Other leisure activities nearby: fishing, bowling, water park (3 in the vicinity: Hirschaid, Bamberg, Forchheim), golfing, great cultural offer in the area around art, literature and music, indoor playground, canoeing, bowling, climbing, miniature golf, Mountain biking, Nordic walking, cycling, gliding, shopping, skating rink, hiking u. V. M. Detailed information can be found in the apartment. Feel free to contact us if you have any questions.